W. David Powell reaches into his unique reservoir of scientific, historical, literary and visual references for an exhibit at the White River Gallery @ BALE in South Royalton. Titled "The Golden Era of the New Dawn & other distractions," the show of 32 collage and print works is on view through July 1. Powell's fascination with science is playful, but his work also speaks to the lack of that interest in contemporary culture. "I am increasingly interested in the 19th century, when knowledge was shared and scientific pursuit was part of a holistic 'natural philosophy,' not a narrow search for new weapons or drugs," he writes in an artist statement. "We have lost much of our childlike wonder and awe for a universe that presents us with new marvels. The need to quantify existence has become a shackle to science and education." Powell himself is in no danger of losing his sense of wonder and awe. 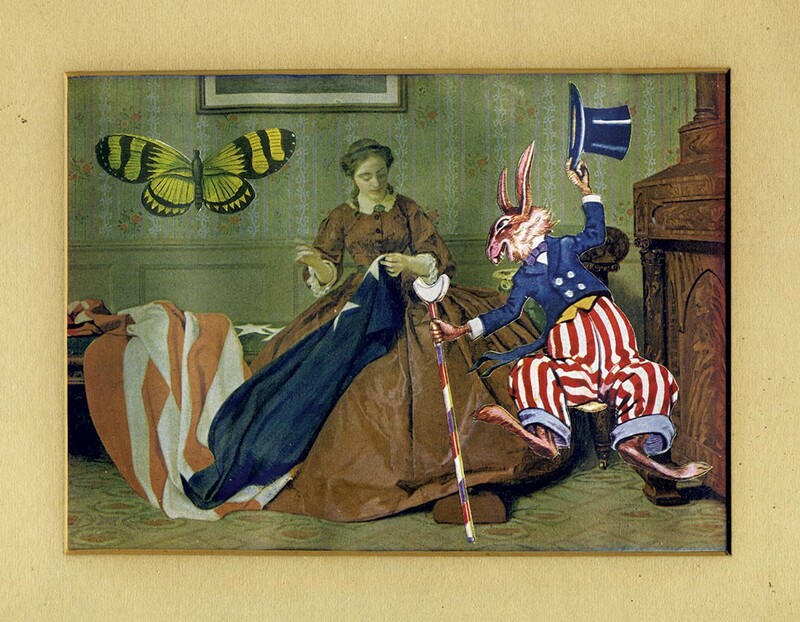 He brings viewers along for the ride through his seemingly limitless collection of images from old books, magazines, maps, postcards and other ephemera, which he repurposes as exquisitely executed collages and prints. His skillful cutting, imaginative assemblage and other techniques make each image a seamless whole. In Powell's hands, disparate elements coalesce into something new and mysterious, a sum greater than the individual parts. 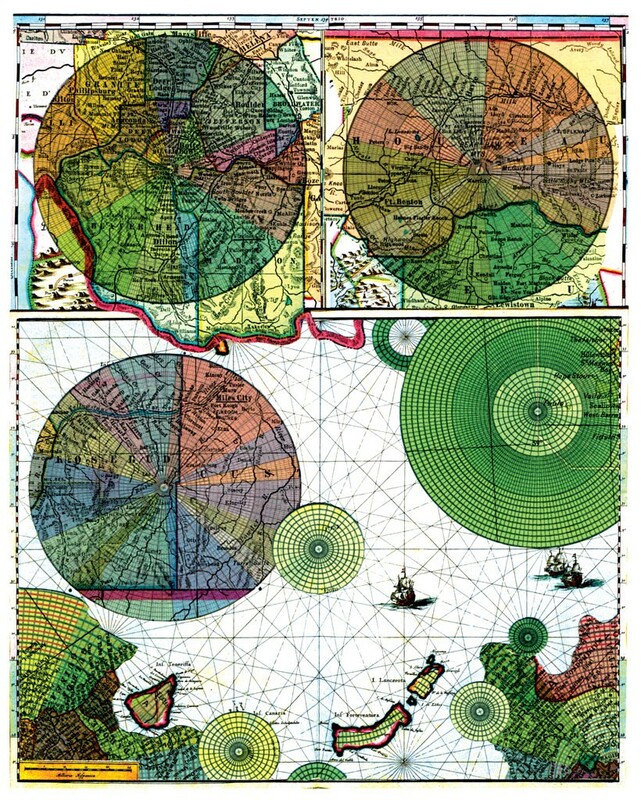 "Globalization the Prequel," for example, overlays old maps with grids in a collage of four large "globes" and numerous smaller ones. The effect is that of an imaginary world, but labels in bold imply otherwise. Rosebud and Miles City, for instance, actually exist in the lower 48 states. The former name has multiple potential references: the Rosebud Indian Reservation in South Dakota, the mysterious dying utterance in Orson Welles' Citizen Kane, the bud of a rose, a term of endearment. The work inspires thoughts about the world before the era of globalization, yet presents more questions than answers. If mystery appeals to humans generally, mystery in art has a special appeal; it gives people the opportunity to enter an endless loop of satisfaction as they ruminate on what they see. Such mystery is here in spades. A Georgia native, Powell received his BFA in painting from the University of Georgia and an MFA in visual art from the Vermont College of Fine Arts. Currently he is an associate professor of art at the State University of New York at Plattsburgh. Powell's work has been exhibited in Massachusetts, Illinois, New York and Vermont and forms part of numerous university and private collections. Among the many achievements in Powell's decades-long graphic arts career was his award-winning cover for Eat a Peach, the Allman Brothers Band's third studio album. Powell found inspiration for it in a couple of vintage postcards he purchased at an Athens, Ga., drugstore; one depicted a huge peach on a truck, the other a watermelon on a railcar. Such strong graphic images continue to appear and resonate in Powell's work today. Words and wordplay contribute another dimension to his work, often imbuing his images with humor and providing clues to his intention. That wordplay can be maddening and charming in equal measure; it's not always easy to grasp Powell's meaning or to determine if he intends any meaning at all. In the small gallery, curator Dian Parker has superbly organized groupings of two to four works each, arranged in various ways. The most visually arresting is a trio of painted wood panels whose titles are palindromes. The phrases "Bird Rib," "DNA Land" and "Lion Oil" are incorporated into the works, too. 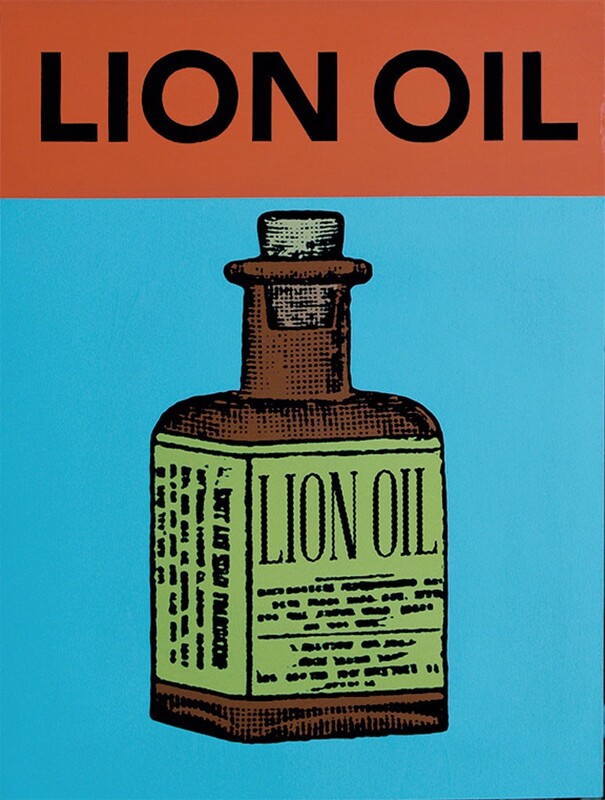 "Lion Oil" calls to mind the advertising labels that once appeared on wooden boxes of produce or other goods. The words "lion oil" in capital letters dominate the top of the work; a corked brown bottle of "Lion Oil" fills the lower portion. This visual gives traction to the idea that there is such a thing as lion oil and conjures the powerful image of a lion in the viewer's mind. "DNA Land" (acrylic and carbon transfer on wood panel) and "Bird Rib" (assemblage and acrylic on wood panel) are less specific but still tease the imagination. The latter piece incorporates a circular proportional scale that covers a painting/collage of a bird skeleton, which is not to scale. Solving the riddles in Powell's work might lead to a better understanding of it, but the artist doesn't seem to demand that of his audience. Puzzles are fun whether you solve them or not. Grouped together are "Portrait of the artist as a young boy," "Daddy" and "Innocence." Created in 2013, all three collages evoke youth. "Innocence" consists of a baseball, a pair of boy's black-and-white Buster Brown shoes, and a dinner fork. "Daddy" uses generic icons — a saw, a hat and an accounting sheet — to signal a grown man from a child's perspective. A standout in the exhibit, "We Are on a Mission" incorporates pen and ink and calligraphy. A bit of ornamental paper adds a decorative element. An ancient Asian schooner appears to hover on the horizon, looking very much like a line drawing. What seems to be handwritten kanji (Japanese writing using Chinese characters) fills the bottom of the piece. A series of tiny vertical ink lines erupts from the writing, possibly hinting at fire, deforestation or devastation. "We Are on a Mission" is less surreal than some of Powell's other works, yet highly evocative. Powell's title for his exhibit could be a play on the "Golden Age" — the classical term for a period of perceived greatness, used by different nations to refer to different eras. The Golden Age of Greece (circa 500 to 300 BC), for example, created the building blocks of civilization — art, philosophy, architecture and literature. For Powell, however, the metaphor most likely refers to an idealized state when human beings were pure and free from suffering. Or perhaps to a time when scientific learning and achievement were held in high regard? Either way, a visit to his exhibition presents a golden opportunity to find out. The original print version of this article was headlined "All Together Now"